Admiral Merlin is a native of Tampa, Florida, where he now resides after completing a thirty-four year career in the U.S. Coast Guard. During Admiral Merlin's Coast Guard career, he was assigned on Coast Guard Cutters in the Atlantic, Pacific, and Caribbean, and served in several shore engineering and RDT&E billets before serving as the Twelfth District Chief of Operations and Chief of Staff in San Francisco. Assignments at Coast Guard Headquarters as Comptroller (Chief Finance Officer) and Chief of Command, Communications and Control preceded his final assignment on active duty as Commander, Eighth Coast Guard District, New Orleans. Following active duty, Bill established the Gulf Region of Marine Spill Response Corporation, the largest oil spill response organization in the nation. He recently completed a 1-year tour as Deputy Director, National Center for Maritime and Port Security. In 1996, Bill developed a course in oil spill response management for the Louisiana Oil Spill Coordinator's Office, and is now serving as the principle instructor for the classes. Admiral Merlin is a graduate of the U.S. Coast Guard Academy; U.S. Naval Postgraduate School; Defense Weapons Systems Management College; and the Industrial College of the Armed Forces. 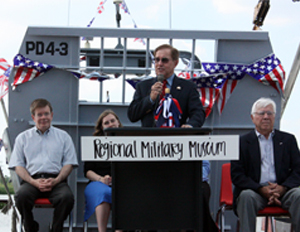 *** Pictured above is Bill presiding as Master of Ceremonies at the christening of the LCVP Marvin Perrett, at the Regional Military Museum whose mission it is to honor all Veterans from all service branches from all U.S. Wars.